As most of you know by now, former Burleson County District Attorney Charles Sebesta was disbarred last week for hiding exculpatory evidence in his Capital Murder prosecution of Anthony Graves. For those unfamiliar with this sad story, Anthony Graves spent 18 years on Death Row after being prosecuted by Sebesta. The 5th Circuit overturned his conviction because Sebesta withheld exculpatory evidence and Kelly Siegler was ultimately appointed as the Special Prosecutor to retry Graves. After reviewing the evidence, Kelly publicly stated that Graves was an innocent man and dismissed the case against him. The story of Anthony's case is well documented. It was covered by CBS's 48 Hours and was the subject of several articles (see here and here) by Texas Monthly's Pamela Colloff. Sebesta responded to his earned public bashing by creating his own website, where he simultaneously defended himself while blasting Kelly Siegler and insisting upon Anthony Graves' guilt. In April of 2011, I posted this article on him in response to his website. Sebesta quickly became the poster child for the dirty, evidence-hiding prosecutor. Ultimately, I think Charles Manson had more supporters than Sebesta. His disbarment last week was something that was regarded as a small but very righteous event that everyone could support. On Tuesday, it was brought to my attention that my article on Sebesta had been cited in this article by columnist Rachel Alexander of the conservative website townhall.com. Just the title of the article "The Left Disbars Another Conservative Prosecutor" was enough to make me do a double take. The idea of me being labeled as a leftist member of the media gave me a case of the giggles. 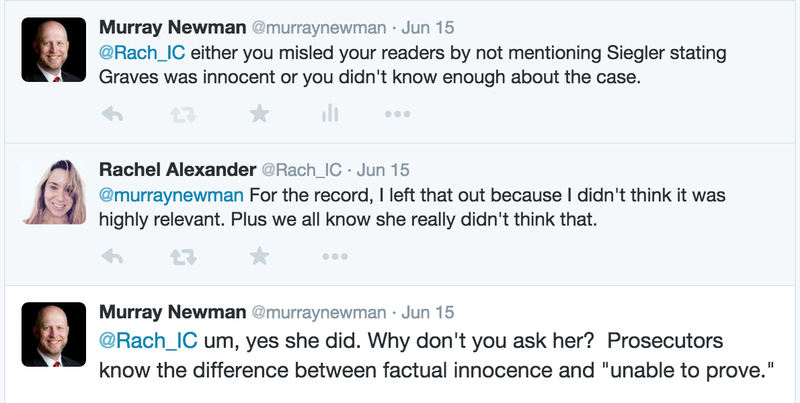 Her statement, "Most accounts don't attempt to say that Graves was innocent," was just ridiculous. 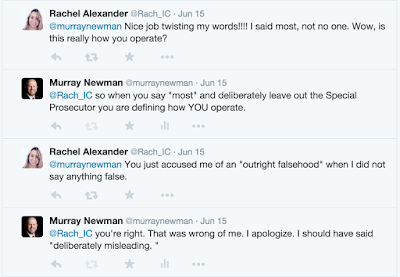 So, I took to the Twitterverse to engage Ms. Alexander in conversation. Hilarity ensued. 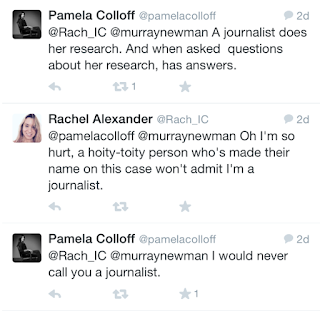 Seeing that Ms. Alexander's response was clearly well-thought out and not at all silly, I decided that Pamela Colloff might enjoy Ms. Alexander's musings. And then we started really arguing. The argument went from bad to worse. So, um, she left out the fact that the Special Prosecutor (who was arguably one of Texas' most aggressive prosecutors) said that Graves was innocent because she "didn't think it was highly relevant" and then follows it with "We all know she really didn't think that." Yes, because we all know that Kelly Siegler is constantly saying things that she doesn't mean . . .
At this point, I know I should have disengaged. Ms. Alexander was clearly immune to logic. 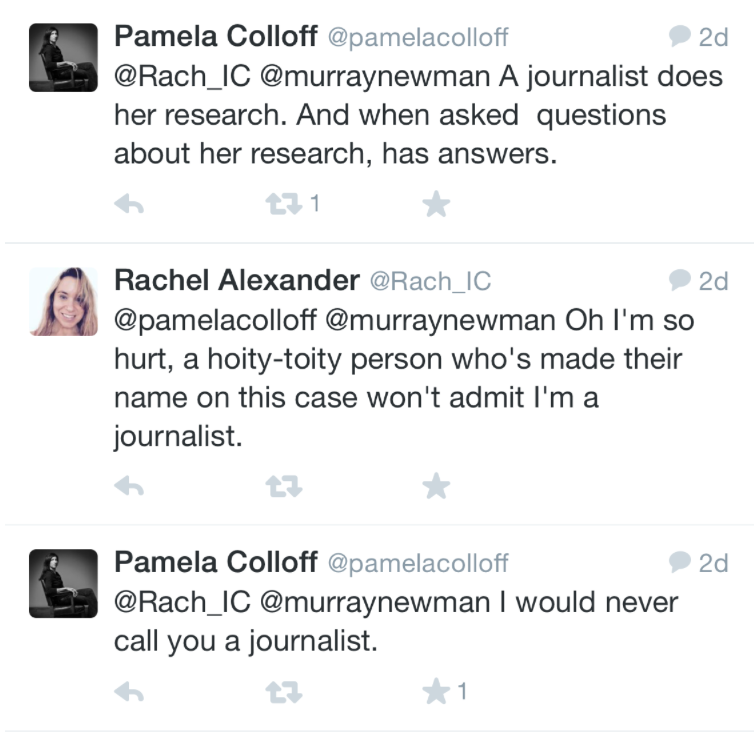 But them Pamela Colloff joined in and it was too entertaining to walk away. And then Pamela delivered the message that I should have just realized before even engaging with Ms. Alexander. 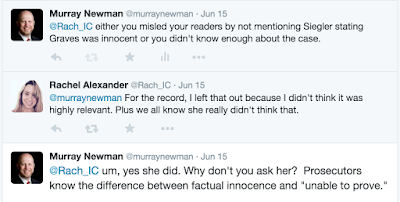 I had actually started off the Twitter-dialogue with Ms. Alexander in hopes of showing her what Charles Sebesta really was and pointing out to her that even the most conservative ideology wouldn't support what he did. Clearly, I failed in that, but it did make for an entertaining afternoon. I was 17 years old and a Junior at Bryan High School in November of 1989. I was a pretty boring kid, for the most part. I didn't drink. I didn't smoke. I didn't do drugs. I usually came home long before my curfew. I guess it was due to that same boringness that my parents signed off on letting me do the biggest adventure of my high school career. On Wednesday, November 8th of 1989, my friends Marshal Crenshaw, Chris Wiseman, Brandon Pillans, Andy Winn, Brandon Crowe and I all borrowed Mrs. Crenshaw's mini-van and were allowed to drive from small-town Bryan, Texas to the big city of Houston to see the Rolling Stones play the Astrodome as part of their Steel Wheels concert tour. Somehow, even though I was far from a good driver and I had never driven in Houston, I ended up being selected as driver. Let's just say that was probably where my longstanding hatred of Houston METRO buses was born. Because I was such a terrible driver and had no idea where I was going (in the days before Apple Maps and Waze), we got there a little later than anticipated, and the opening act of Living Colour had already begun. Luckily, we got there in time to hear them play Cult of Personality and Glamour Boys as well as a lot of other songs that were pretty awesome, too. They rocked it out on a great performance before leaving the stage. It seemed like the time after the opening act and when they finally dimmed the lights took forever, but finally, the Astrodome went dark. An instrumental build-up of Continental Drift started playing in the background, getting louder and louder. Then it abruptly stopped and the stage exploded into fireworks as Keith Richards started playing the first chords of Start Me Up and the Stones all came running onto the stage. It was the coolest thing I had ever seen in my life. It will probably shock you to hear that not that many acts came through Bryan/College Station. My illustrious career of concert attendance had begun with seeing Toto at G. Rollie White Coliseum on the A & M Campus. I had never been outside of Brazos County to see a concert -- certainly not one of the magnitude of the Stones. The next two hours were amazing as they cranked through song after song with pyrotechnics and special effects. I remember two giant sized inflatable women flanking either side of the stage during Honky Tonk Women. 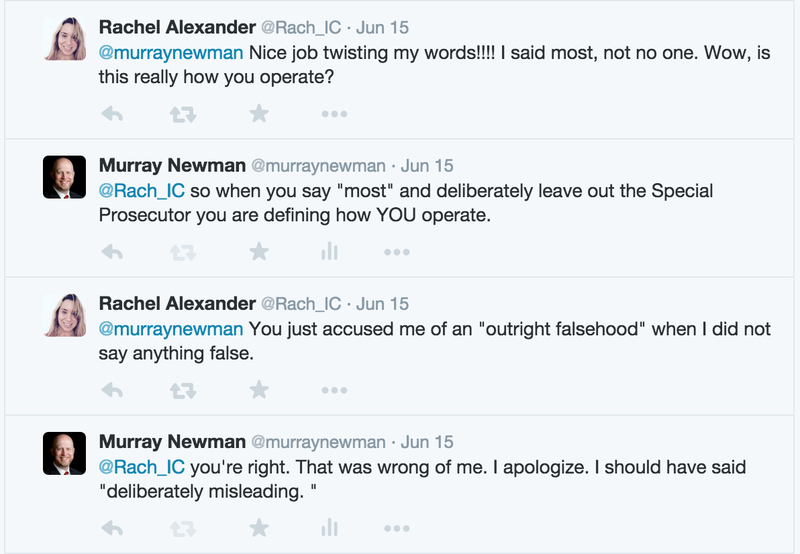 To paraphrase my 9-year-old, what happened after that "wasn't appropriate." The Stones wrapped up with Jumping Jack Flash and Satisfaction and we all headed back to the car -- which we had lost. In the Astrodome parking lot. In Houston. At midnight. On a school night. We pretty much had to wait for almost everyone to leave before one of us finally found Mrs. Crenshaw's non-descript mini-van. We all piled into it -- for some reason, nobody wanted me to be the driver anymore -- and headed back for the two hour drive to Bryan. A radio station replayed the play list of the concert as we drove back and we listened to it for as long as the car radio could pick up a Houston station. At some point, I fell asleep and my body slid into the footwell as if I were in crash position. We got home around 2 a.m. and all went to our respective homes. I think if we were honest, all six of us would have admitted that we didn't really know that much about the Rolling Stones when we started out on our adventure. We knew the idea of being able to casually tell our classmates "Yeah, we went down to Houston and caught the Stones concert last night," sounded really cool. Quite frankly, I probably only recognized half the songs that they played that night. But, man, that next day, we were all wearing our concert t-shirts to school and acting like we were founding members of the World's Greatest Rock and Roll Band. If you know me at all, you know that when I get on a topic, I get obsessed, and for the years to come, I was obsessed with the Stones. I bought all of their music, read up on the history of the band, went to their concerts any time they crossed into Texas. I've gone to see them with friends, girlfriends, and even my mom and dad. As a side note, it is really awkward to watch the stage production of Honky Tonk Woman when you are sitting next to your mother. I've read Keith Richards' autobiography, Life and enjoyed it very much, because I loved Keith's enthusiasm for the origins of rock and roll music. Bruce Springsteen is the same way. Quite frankly, I think that the way I feel about the Stones is the way Keith felt about all of the old Blues musicians and early 1950s singers and bands. I love that music -- from Buddy Holly to the Beatles, to the Band to Springsteen to the Stones, and all of those bands that kids today will look at as a history lesson rather than a playlist. Yes, I just used the phrase "kids today." Now get off of my lawn. When my first son was born in 2005, he heard a lot more Beatles music than nursery rhymes growing up. His first phrases started with "It's one for the money, two for the show . . ." I taught him the names of all the Beatles and all the Stones and he could recite them when called upon (a party trick that impressed my current wife the first time she met 3 year old Luke.) I would do my best Keith Richards' impression and ask him, "What are you doing, Mick?" Having been born right around the time that Hurricanes Katrina and Rita hit the Gulf Coast, my son will tell you very matter-of-factly that he, too, was born in a Crossfire Hurricane. I suffered many an eye roll from his mother. As he got older, we would listen to the songs and how they were written. I developed a three act "bucket list" of bands that I wanted him to see before the groups stopped playing together on the road. On November 14, 2012, I took him to see Paul McCartney at Minute Maid Park as he played all the Beatles songs. He loved every minute of it. On May 6, 2014, he saw the second band on the list when we went to see Bruce Springsteen and the E Street Band play the Cynthia Woods Mitchell Pavilion in the Woodlands. He loved it and we got this close to Bruce when he first drove into the building. And, finally, in a couple of hours, we are going to load into my car and take a father/son road trip to Arlington to see the Rolling Stones play AT & T Stadium. I'm so ecstatic that I can't see straight. After playing together for 51 years, I was starting to get worried that the Stones might not actually come back to Texas. The first time I saw them play, the band members were all in their mid-40s -- now I'm the one in my mid-40s. Come Monday morning, my 9 year old boy will get to go back to his summer day camp with his Rolling Stones t-shirt, acting like a founding member of the band. Keith Richards' guitar intros on Satisfaction, Jumping Jack Flash, and the very "inappropriate" Honky Tonk Woman will be things he heard live. And "moves like Jagger" will be something that he actually witnessed with his own eyes. My dad told me that when he was younger, he got to see Elvis play, which I always thought was awesome. When my son is older, he will be able to say that he saw the Stones. I can't wait to be standing right next to my son as he sees true Rock and Roll history. I love seeing these bands play through his eyes. I hope some day he will love the music as much as I do and feel the sense of history and emotion and excitement of the Rolling Stones as they play Texas one more time.